Leave it to NYFW newcomer Neubyrne to hop on this trend with fervor. A standout piece from Neubyrne’s debut collection was a hot yellow gown equipped with sparks of blue tulle for sleeves. A Détacher, a brand I’ve come to love for their robust, neutral tones, kept true to their muted aesthetic for the most part this season, with one exception—yellow. Of course, it was a softer tone rather than canary, but I am still calling it Gen Z yellow for the sake of this argument. 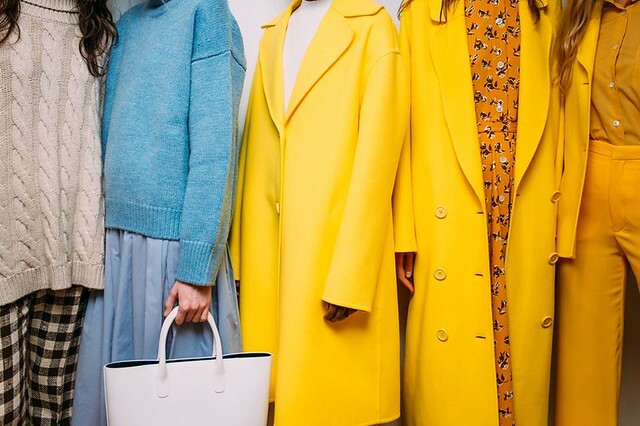 Even current “it” brand (and millennial pink instigator) Mansur Gavriel is getting in on the action with a canary yellow coat that I am drooling over. Yellow is clearly having a moment—which means the fashion set is already thinking of the next couleur de la seconde. If millennial pink is our generation’s first wife and Gen Z yellow is the hot new thing in town, what shade will be next? My money is on a Fall/Winter 2018 flirtation with mint green, perhaps a softer, creamier cousin of Pantone’s 2017 Color of the Year. But, I guess we’ll just have to wait and see.